We left my daughter’s “Fluffy” on the airplane on June 13. We have exhausted all hopes of finding it. I just happened to find your site and am so hopeful for help in finding another Fluffy for Ansley. 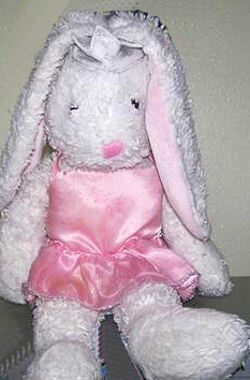 She was bought at Walmart, around Easter of 2005 or 2006. She is a Dan Dee Collector’s Choice rabbit, and I believe it was part of their “Build-a-Bear” type line that came with optional clothing. My daughter, Ansley, cannot stop talking about her Fluffy, and she keeps thinking Santa Claus will bring it. I want so much to find her a replacement. I would appreciate your help, as our house has not been the same without Ansley’s Fluffy! We don’t care about having the ballet costume, just the bunny rabbit! Thanks for anything you can do for my daughter. She cries all of the time for her Fluffy. We are still looking for fluffy, any help would be greatly appreciated!! Still hoping to find fluffy, a year later. Thanks for any assitance you may give us! Hello. Here is one that isn’t exact but very similar. It may be better than nothing? The clothes are attached and cannot be removed. Oh my! The ebay bunny looks VERY close! I will order him right away! Thanks so much, I have looked on ebay forever, and never saw this! Thanks so much and I will post after he is adopted.. I just wanted to let you know that I bought the last ebay bunny which was suggested in 2010. I should have posted to let you know that Ansley has her fluffy-maybe not the original lost one, but close enough!! She was very happy and excited when he came in the mail! She still has him 2 years later and sleeps with him every night. Thank you so much for the work you do! God Bless You!